KUALA LUMPUR: Malaysia today condemned the terror attacks in central London where six people had been reported killed. Prime Minister Datuk Seri Najib Tun Razak said he was devastated by the incident. "I am shocked and disgusted. Malaysia condemns such heinous acts and we stand with the people of Britain," Najib said in his latest tweet today. 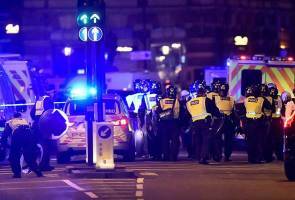 International media reported at least six people were killed in a coordinated terror attack at London Bridge and Borough Market in central London late Saturday night. Three suspects were shot dead by the police. The attack comes nearly two weeks after a suicide bomber killed at least 22 people in a concert at the Manchester Arena in Manchester.